Yesterday(August 6th) Alyssa Milano stepped out in two different looks to promote her new Netflix series 'Insatiable'. She posted her look to her instagram page. 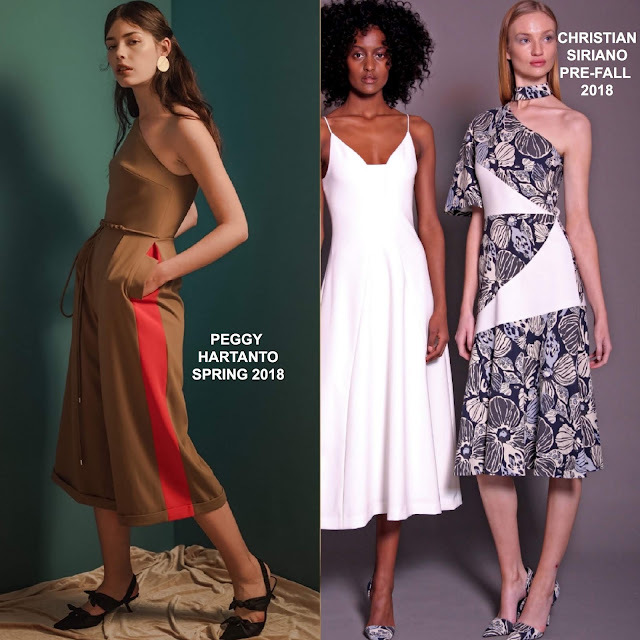 First she stopped by Good Morning America and she posed for the gram wearing a PEGGY HARTANTO SPRING 2018 brown one-shoulder, culottes jumpsuit featuring side pockets and contrasting red side panels. While I think her LORIBLU color-block sandals worked perfectly with her jumpsuit, the ELISABETTA FRANCHI bag feels out of place. She finished up with pink lips, layered tresses and LANA jewelry. Next, she stopped by Live with Kelly & Ryan, posing for the gram wearing a CHRISTIAN SIRIANO PRE-FALL 2018 one sleeve dress with a cutout neckline one side. Alyssa looks great in this dress but on this occasion, the look book's matching pumps actually works better than her navy SAM EDELMAN pumps. H. STERN jewelry, a KATE SPADE NEW YORK bag and a up-do finished up her look.